I'm leaving! For the rest of the Labor Day Weekend, I'll be splitting my time between Dragon*Con in Atlanta and Decatur Book Fest in Decatur (near Atlanta). If you're near the area, come introduce yourself to me! In the past two days, the entries for the Creative Contest literally doubled! Between the increase in entries and the fact that I'm leaving tomorrow--I just can't decide on the winner right now. It will be the first thing I do when I get back early next week, though, I swear! It's just that you guys are so awesome that I can't decide!! And, just in case you'll be in Atlanta for it, here's my schedule! o Harry Potter from Page to Screen: High and low points of the movie franchise; did the books translate well? o The Hero’s Journey of Neville Longbottom: How does the Hero’s Journey translate to Neville and other secondary HP characters? o Online Interactions: How do kids and teens use technology to interact with books and authors today? Do they expect more as they turn the last page of that novel? You have until midnight to get any last entries in, but I wanted to show you all the entries I've received so far! YOU CAN CLICK HERE TO SEE A LARGER VERSION OF THE POSTER--AND REMEMBER, THE WHOLE THING IS INTERACTIVE, SO FEEL FREE TO CLICK AWAY! Below is a list of full credits for the above Glog and links to other entries. If the entry was sent via a link, I've linked it both below and in the Glog. If it was emailed or given to me in person, there is no link. Please let me know if anything doesn't work! -Anyone who submitted their entry after 2:00 EST August 30 isn't in the Glog, but I'll be adding updates here when I can! to enter the Creative Contest!!! You can find out more information on the contest here, but make sure you get your entries in by 11:59 PM Eastern Standard Time TOMORROW, August 31! We've got some simply AMAZING entries so far--like you would not even believe--but remember, there are two prizes--one is for the most creative, one is a random drawing of everyone who enters! And the prize? The very first signed copy of A MILLION SUNS that I've giving away! The only other people who have signed copies AT ALL are my parents, my in-laws, and my husband! Also: a custom-made charm bracelet. Also: a secret prize to the creative winner. AND? Don't forget to enter the secret prize contest hosted by the fansite! I think that my favorite thing that authors do in writing is foreshadow. A good use of foreshadow will make me fall in love with an author like nothing else. 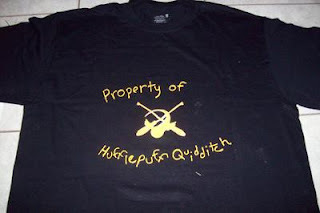 To be honest with you, my adoration of JK Rowling started with foreshadow--she layered in the Polyjuice Potion that was crucial to Book 4 in Book 2, and by that point, I was just head-over-heels. Guys, good foreshadowing is just smexy. Foreshadow takes skill. It requires one of two things--either the author has to plan out the important clues from the beginning (especially difficult if you're dealing with a series instead of just one book) or the author has to use the situations/objects/characters she's already established in the story in a significant way later on. And either way you do it, you've got to make it clever. In a lot of ways, foreshadowing is like a magic trick. Magic are all about diversion. I make you look at the flash and bang over here and you don't notice the card up my sleeve over there. Likewise, (good) foreshadow is all about showing you something in plain sight over here, but hiding its significance over there. Foreshadow is essential--essential--to a good story. But bad foreshadowing? Bad foreshadowing can kill a good story. For example: y'all know I have some love for Doctor Who, right? Well, last night I watched the latest episode "Let's Kill Hitler" (and if you've not seen it, stop reading now to avoid spoilers). And...as much as I love Doctor Who, I have to say...the entire storyline is weaker to me now because it didn't use good foreshadow. In fact, it didn't use any...and it totally should have. Here's the thing: it tells the story of Mels, Amy and Rory's childhood friend who is (a) obsessed with the Doctor and (b) brings him up all the time and (c) is the person Amy and Rory named their daughter after. And...she has never EVER been brought up on the show AT ALL. There's a complicated plot twist about Mels that you can read about here, but the thing is--I didn't care at all. Do you know how cool it would have been if, when we saw Amy as a child last year, we also saw childhood Mel? How about if Mel had been at Amy and Rory's wedding (if she was significant enough to be the namesake of their child, why not have her at the wedding)? How about if--in the last freaking episode--Amy had mentioned that her daughter was named after her childhood friend? But no--none of that was there. Which made the entire story not very believable. Which drove me mad. Which meant that this story of Doctor Who--which I've loved so far, full of time travel and witty dialog and clever plot twists--is diminished in my eyes. That is the power of foreshadow. Here's my dark secret: I like reading book reviews. The snarkier the better. In fact, I prefer it when the reviewer just rips the book a new one, decimating every single plot point and tearing the characters apart in an inky massacre. But...uh...I don't like reading those sorts of reviews if they're about my book. When I'm feeling really bad about my writing, or I've lost confidence in myself, or if the word-well has just run dry, I log onto GoodReads. I shield my eyes of any reviews of ACROSS THE UNIVERSE (good or bad), and I look up my absolute favorite books, and read the negative reviews of them. It reminds me that all writing is subjective, and that not everyone will like every book. But if I'm feeling really bad, I'll look up the books I don't like, and I will read the snarkiest, meanest reviews of them, and in my head, I get my snark on, too. It still reminds me that writing is subjective--but it also reminds me that I care about quality. I think of the things I value in writing, and I take comfort in the fact that others value that, too, and call other writers on those issues. And also? It reminds me that people do pick apart books for entirely valid reasons. It reminds me that when someone reads my books, they may be doing it with an eye to poke holes in the plot, dig into the characters with a sharp knife, rip apart my words. There's a problem with the idea that just because you wrote a book, it's good enough to publish. There's also a problem with the idea that just because a book is published, it's good. Last night, I was up until 3:30 am writing out notes for my last-chance changes to A MILLION SUNS. I'll be honest: there came a point where I was just staring at the page, debating whether or not I really needed the comma to set off the prepositional phrase, or if it was fine without. So I read a review of a book--a truly vicious, nasty, snarky review, and it tore apart the text word by word. And it reminded me: I'm not a special snowflake. People can--and will--do that to my book, too. So I better make it the best I possibly can. I kept the comma in. I've been getting a lot of questions about Advance Reader Copies (ARCs) recently, so I wanted to do a quick post about them. First: yay! ARCs! They are shiny and pretty and also terrifying--eep! People are actually reading this thing! And before I go further, I want to remind you: if you're a reviewer who would like to request an ARC, please do so through this form. But also, please know: my publisher will be selecting who gets ARCs, and I've already been informed that we've gotten more requests than ARCs currently available, but not all have been sent out yet. You can read more about Penguin's ARC request policy here. Also? Please don't ask me for one. I honestly don't have any to share. I got just enough to share with a few members of my family and for the contests that I am planning on doing from now to the end of the year. There are two specific reasons why I wanted to bring up ARCs today. The first is: Please don't feel bad if you don't get an ARC. There seems to be a strange sort of hierarchy on blogs lately, a sort of grouping between the "haves" and the "have-nots." ARCs are not a status symbol. It's not a bad thing if you don't get an ARC. The Waxman Literary Agency did a great post about this not too long ago that I highly recommend, but the long and short of it is simply that ARCs are a tool used by publishers for publicity, and there's no reason at all for you to feel bad if you don't get one. The second reason why I wanted to talk about ARCs is that: Please remember that ARCs are advance, uncorrected copies, and that there WILL be changes between ARCs and the final copies. Michelle Hodkin recently posted about this, and, like her, there's going to be a change between the ARC and the final copy of my book. In fact, I'm bouncing off the walls about a particular change. I mentioned in a note to my publisher that I thought it would be neat if we did something with a certain scene using a graphic, and I honestly thought it was just not feasible to do...but I am reading the final pass pages of the final copy of the book right now, and THEY DID IT! And it's so PRETTY! And I can't wait for people to see the final copy of the book!!! ZOMG!!! I sort of want to go like a ninja to every person who has an ARC, rip it out of their hands, and say, "WAIT! WAIT! The final copies are going to be so much BETTER!" What a lot of people didn't realize about the Ash to Nash tour is that it's something we developed, organized, and paid for ourselves. This is not a tour we would have thought about if Melissa Marr, Kelley Armstrong, and Jennifer Lynn Barnes hadn't led the way with the Smart Chicks Kick It Tour. Their idea--to make a tour their way, in their control--was truly inspiring and the first I'd ever heard of authors banding together in this way to bring their works (and their selves) to their readers. Since then, there have been more similar author tours (notably here and here). So! Ash to Nash was a totally self-made, self-run tour between myself, Myra McEntire (HOURGLASS), and Victoria Schwab (THE NEAR WITCH). We went to 8 cities, sold tons of books, had even more fun, met so many great people, and did it all for about $200 each. So--I want to break down a little how we did it. For entirely selfish reasons. Because honestly? I'd love it if more authors did this. More book events that I get to attend! Yay! We got the idea for Ash to Nash after meeting each other at a writer's retreat. We got along well, all had debuts, and all lived in close to the same area. Honestly? That was enough. You don't have to have a huge theme or anything--we just realized that we were close enough to have a reason to tour. Myra's book takes place in present day; mine's in the future; Victoria's is in the past. Myra's book has time travel and sass; mine has space travel and murder; Victoria's has lyricism and magic. They are very different books. But they're also similar. All three are YA. All three have smart YA female leads. All three involve an element of unreal. And more importantly? We all three got along really well. So we knew we could talk and entertain readers in the audience, and we had enough in common to link it all together. So, step one? Decide who to tour with. Communicate with your publisher. They are wise, experienced, have advice for you, and can help you come up with everything. Do this first. Agree on finances. We decided to split everything equally three ways, with one person putting everything on her card and then dividing up the bill. We had a vague idea of a budget. But this should be the first thing you talk about. Come up with places to tour. We decided to make our locations (Asheville to Nashville) a key thing, and built the tour as a way to give back to our communities--so we focused on Indie bookstores between our areas. Decide on dates. Once you know where you want to go, consider when. We generally did one event a day, but twice we did two in one day. You might think that a tour stop is simple, just a couple hours of time--but they are truly exhausting and take a lot out of you. So, in general, think about limiting how many times you double book, and don't forget to factor in travel time! Come up with an event agenda. We needed to come up with our own tour format, and we also needed to make sure that the bookstores--several of which had never had an event like ours before--knew what to do. We developed a program: one hour of Q&A, one hour + of book signing. We came up with sample questions, and asked the bookstores to have moderators that would lead the discussion. We sent the document to each bookstore, basically an event packet that listed what we're doing. Contact guests. One of the things we wanted to do was feature local authors at each stop. Once we had dates, times, and bookstores confirmed, we went about contacting authors in each local area to have special guest. This involved not only setting up the authors, but also making sure they knew the schedule, including them in marketing, etc. Marketing basically never ends from the moment you come up with the tour, to the actual tour itself. We knew our biggest problem was to get people to actually come to these events, especially in the areas that so rarely have events. Website: The first thing we did was set up http://ash2nash.blogspot.com. In organizing the website, we made sure that the top links were direct links to a post about each event, and that in the post there was clear, succinct, specific information about each event. Spread the News: In order to help spread the news, we offered a giveaway for people who shared info on the tour. We made sure the prize was big--8 signed copies of the books featured on the tour--to entice people to spread the word. We also made it easy: pre-made Facebook links, Twitter posts, and an easily downloadable widget for people to share. Bookstore advertising: To make it easy for the bookstores to advertise the events, we also sent them pre-made posters and bookmarks to hand out to customers. Press releases: We wrote a press release and provided it to the local newspapers and magazines. This was a big surprise--we thought that we were being ignored by a lot of the loca media--but we found out after that every single place we went to featured our tour stop using those press releases! On-site giveaway: To encourage people to (a) come and (b) buy books, we offered a giveaway just for people at the event, and gave them extra entries for every book they bought. Social Media: And finally, during the tour we also used our already established social media contacts to remind people of the events and encourage them to come. And finally: the tour! Here's what we learned while actually on tour. Travel cheaply. We carpooled and didn't stay in a hotel once--we arranged the tour in part so that we were always near one of our houses (or near the house of one of our parents, LOL). Eat and sleep when you can. This is the best advice for anyone on tour ever. Keep it light and entertaining. People attended the tour predominantly to (a) learn and (b) be entertained. So everything we said was geared either to succinct information or to make you laugh. Keep in mind: we split the expenses three ways. The final bill for the whole tour was about $600. But because we worked together, we divided the cost. What we couldn't afford on our own, we could swing by working together. It's important for you to consider yourself, your fellow authors, and the bookstore owners as partners. Don't be a diva. Don't consider yourself better. Be willing to do work, and be willing to work with others. You'll get a lot more done that way. Don't do all the work yourself: if you're working with others, share the load. One person can design posters, another write the press release, and someone else can help with mailings. This is not the time to try to one-up the people around you. Don't try to build yourself up by standing on the shoulders of those around. One of the things we heard over and over was that people had fun because we were having fun. We heard horror stories from some of the bookstore owners about events where the person was just in it to sell books or prove something. It's a lot more fun to just...you know, have fun. Honestly? This tour was exhausting and a lot of work. Most people only saw the end result. They didn't realize that, for the tour in August, we'd been planning since February. They didn't realize that we made the posters, websites, bookmarks, and everything else ourselves--and we paid for them ourselves. But even though it was a lot of work--it was so worth it. 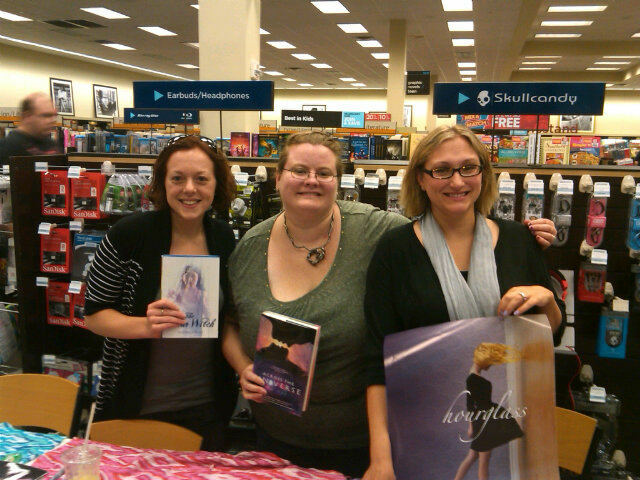 We got to meet so many great bookstores and readers! Nothing--nothing--can replace that experiences! Stages on Pages: This tour is going to feature YA authors whose books deal with singers, actors, and more--all those stages on pages! It's a fun debut tour, so be sure to check out whether or not it'll be in your area--they'll be on the East and West coast. Now that the Ash2Nash tour is over, I've got a little time to recoup--and work on Book 3--before Dragon*Con and the Decatur Book Fest in Georgia. If you're anywhere near Atlanta, get thee to these events! They're awesome. Posting will be...spotty in the near future. I've got to focus on things such as, yanno, writing Book 3. 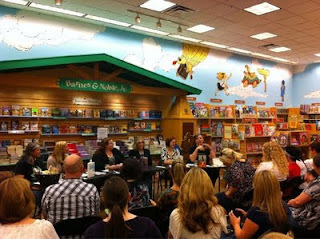 The Nashville Event at Barnes & Noble. Picture stolen shamelessly from here. The BAM event in Kingsport, picture stolen shamelessly from here. Did you know that the roots of this tour came about after the infamous Branson retreat this February? And that Victoria, Myra, and I made this tour entirely by ourselves, with no monetary support from our pubs--for about $200 each? I'm working on a post about this right now actually, but my point-in-brief is this: if you love books and love readers, you can easily give back to the community that made your dreams come true. More details on how YOU can enter for the Creative Contest prize here! How to Get Signed Books! We're right smack in the middle of our tour, and we wanted to make sure everyone knew how to order signed books if they want them! All of the bookstores we've been at ship nationally (and most ship internationally), and you can either order online or through phone at all stores. Or, even better, drop in and purchase a copy! 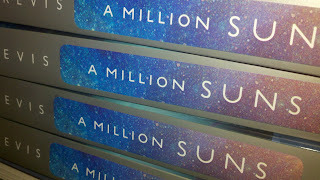 Advanced Reader Copies (ARCs) of A MILLION SUNS have been printed and are, even now, winging their ways to reviewers! Which is, frankly, terrifying. But! If you are a book reviewer and would like to request an ARC of A MILLION SUNS, do not email me. Instead, if you have direct connection with the publicist, email her or if you do not have a direct connection with the publicist, please fill out this form, which will go to my publicist. 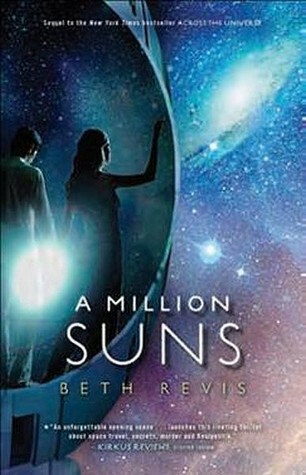 That there above is a teaser trailer based on the cover of A MILLION SUNS by the simsational April. I just wanted to show you that you don't necessarily have to have read either AtU or AMS to enter the Creative Contest--it's totally cool to do something based on the covers. Also, there's a great entry up on the Facebook Page--you should go check it out! I'm on tour! The Ash 2 Nash Tour kicked off yesterday at the wonderful Fireside Books & Gifts, and it was so much fun bringing my friends to my local indie. Today, we're going to the Morganton, NC, public library, and following that up with Malaprops. But....we are having so much fun (last night was Author Sleepover at my house, and we gorged on pasta and then made Lurlene McDaniels and Nicholas Sparks jokes all night) that I can totally foresee me forgetting to, er, blog. Especially since we're going to try to do posts on the Ash 2 Nash blog, too. I found Allison Winn Scotch's post on author platforms--and why even fiction writers need them--interesting. I mostly agree with her; although I don't really call an online presence a "platform" so much. Just semantics, though. Jim Hines had an interesting post on Agents as Publishers. I love this post by Kiersten White so much I can't even stand it. I was going to do a whole post of my own in response, but I'm afraid it would just be a great big giant "THIS" instead of anything actually, you know, intelligent. Remember: if you're posting it into a Blogger post, use the "Edit HTML" tab. Let me know if you have any other troubles! 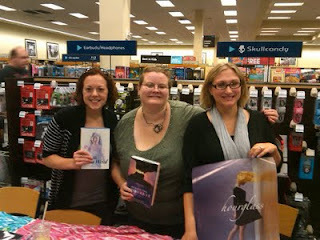 I hope you all had a good time with the YA Scavenger Hunt! I know there were a few hiccups, but I really hope it was fun for all in the end! The winner of the swag pack from me was... ROA! Congrats, Roa! The grand prize winner of ALL 23 SIGNED books will be announced by Colleen Houck. And in the meantime...all those bonus materials are going back into hiding! FIRST: Are you looking for the YA Scavenger Hunt? If so, it's the post right below this one. That's right guys--I'm doing TWO giveaways today! It's August! And, well, that deserves a celebration, no? No? Well how about this: it's only a half a year more before A MILLION SUNS comes out! Squee!! And guys, I cannot wait for you to read this book. 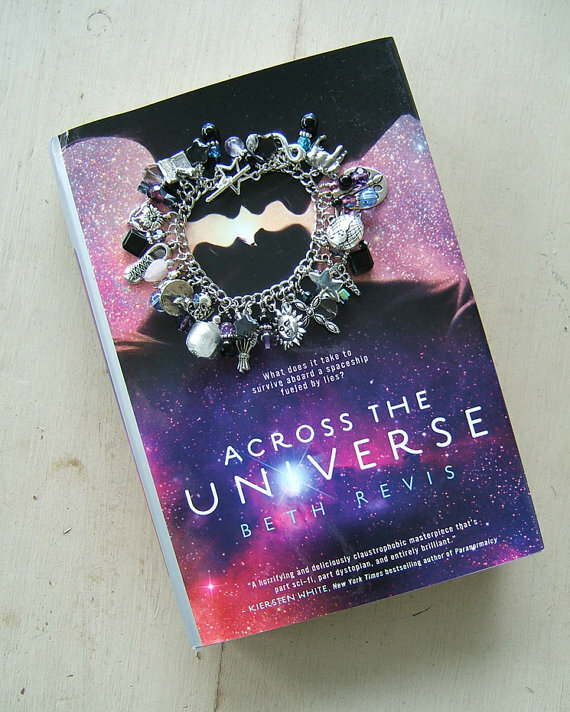 ACROSS THE UNIVERSE was amazing for me because it was my first published book, but A MILLION SUNS is something special because it was the first book I wrote knowing that people wanted it. I've been preparing for this giveaway for awhile. Months. And I'm so excited to finally share it with you all. 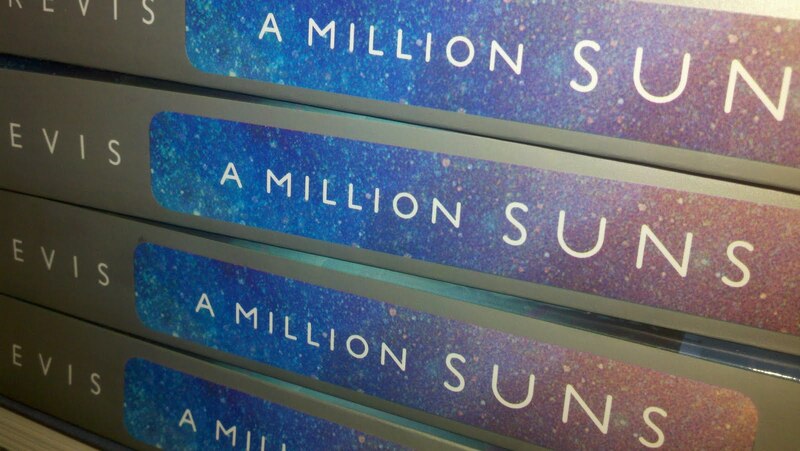 A signed ARC of A MILLION SUNS! 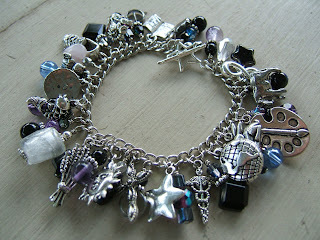 A custom made charm bracelet that fits with AtU! The grand prize will consist of the VERY FIRST ARC of A MILLION SUNS! I...er...actually don't have any yet. But when I do get ARCs, the prize-winner will get the Very. First. One. 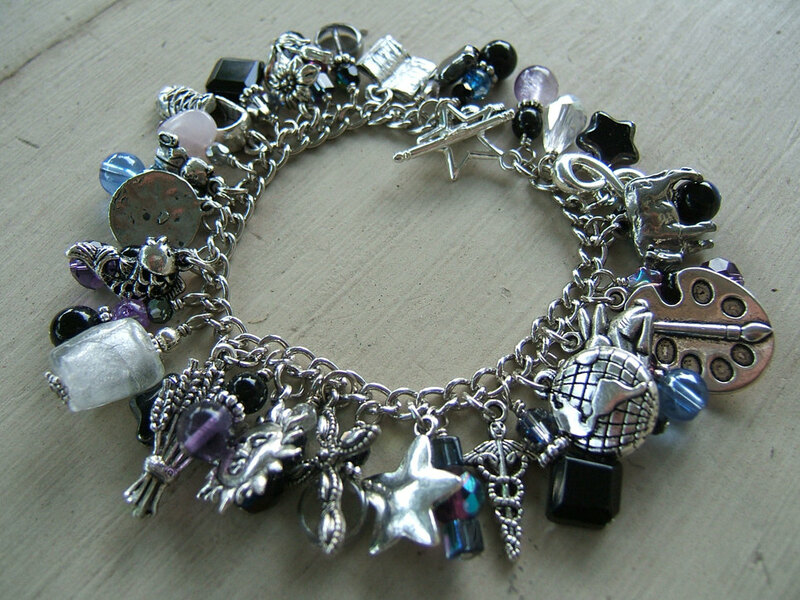 The prize-winner will also get this very cool and very special and very rare charm bracelet. I've talked about how these bracelets came to be in more detail before, but basically, this is a custom-made, commissioned work of art that incorporates nearly 20 charms, each one specific to ACROSS THE UNIVERSE, plus some beautiful beads. The details of this are simple AMAZING. You can read more about each charm here. The bracelet retails for $70--and is so worth it. It's so pretty! A total SECRET! A mystery gift! There will be FIVE runner-up prizes for this contest. What are the prizes? you'll find out what the mystery prize is. 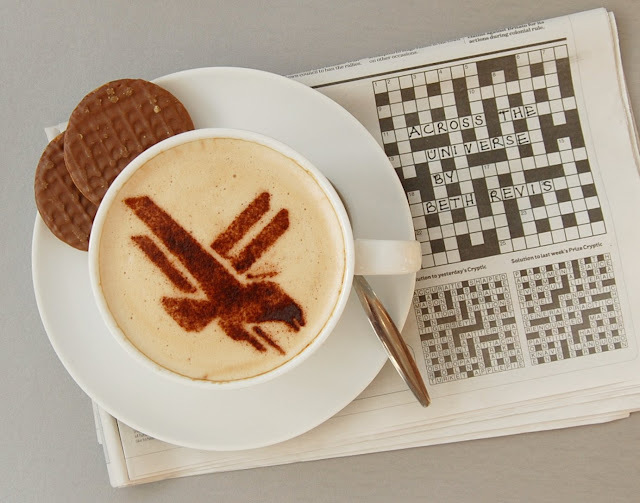 Here's a clue: the mystery prize will involve a key image relevant to A MILLION SUNS. Well, this is a very creative prize. A book that took all my creative powers to make. A bracelet that drips with creativity. And so, to enter, you need to do something creative. But I know that not everyone's good at visual arts, or maybe they want to do something beyond the norm to stand out. And I totally encourage that. 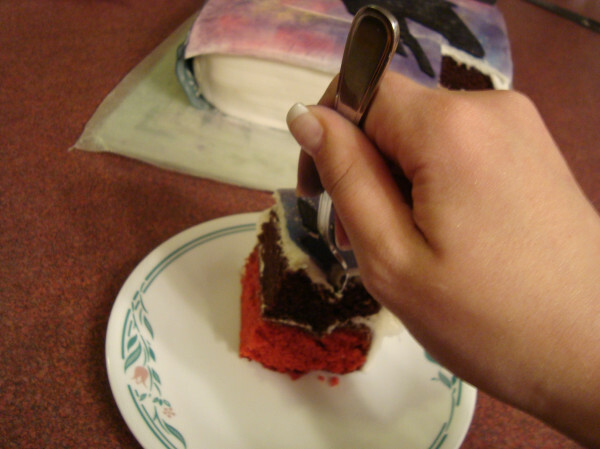 Or maybe you'd like to blend artistic ideas? 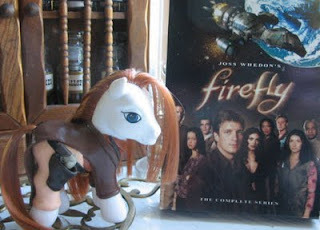 I have to admit, I've always been intrigued by the idea of making a custom My Little Pony. Can you imagine a bright-red-haired pony? Or perhaps you're a fashionista who likes to design t-shirts? What would you put on the front of an AtU t-shirt? Team Elder? 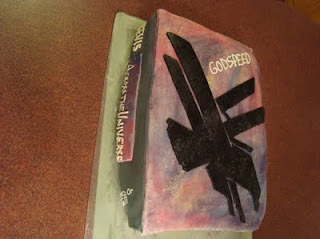 The Godspeed logo? 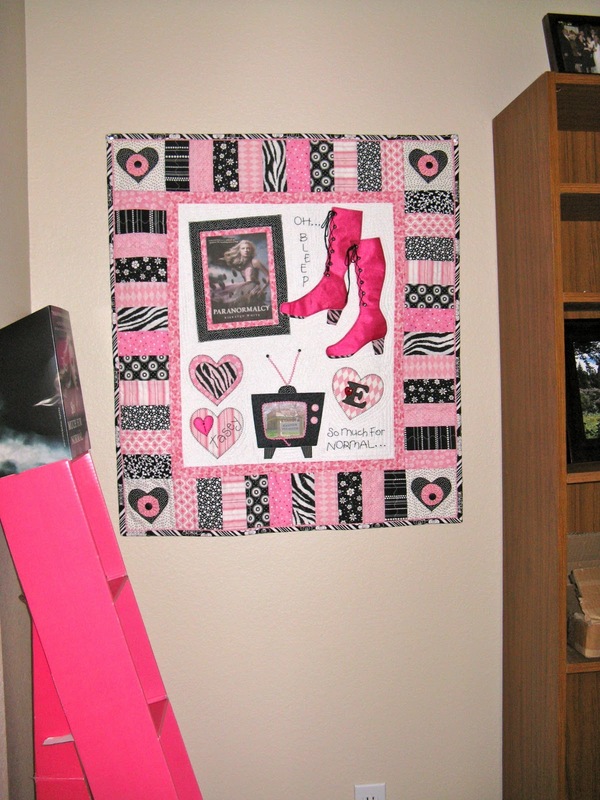 Or maybe you like to quilt or sew? 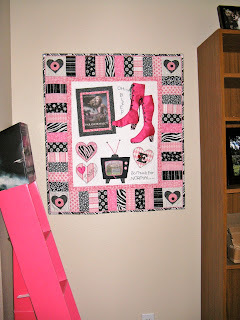 This is a quilt a fan named Kim Walus made for Kiersten White. Isn't it amazing? WHATEVER YOU WANT TO DO! It's all 100% up to you! All you have to do is come up with some sort of neat, unique, creative, fun thing that ties back to ACROSS THE UNIVERSE in some way. A clay model of Godspeed? A facepaint of the ship logo (found embossed on the hardcover)? A haiku about stars? Get some friends together and re-enact a scene from the book? A little design that can be used for pin-buttons? Use stage make-up and give yourself a wi-com? It's all up to you. Now, I know it's going to be really hard to pick a winner. And judging from the last creative contest I held, it might just be impossible. I mean, come on. You guys are good. 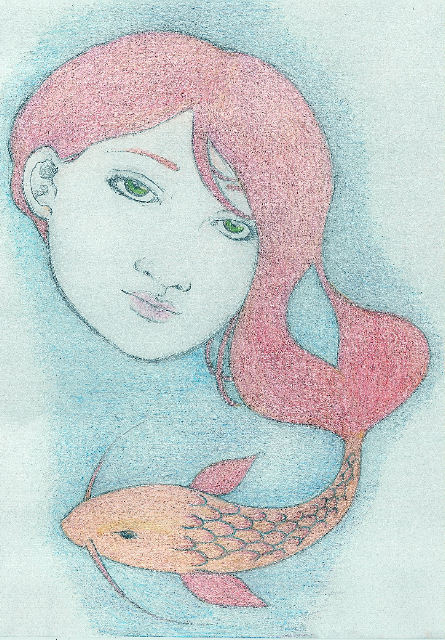 So, I'm going to give the grand prize away based on a drawing. BUT. I reserve the right to give an additional special prize of my choosing to someone (or more than one person!) if I see a creative work that is just by-and-far brilliant and above and beyond and leaves me gobsmacked. Which is really just a fancy way of saying that if you really impress me, I will give out MORE prizes. 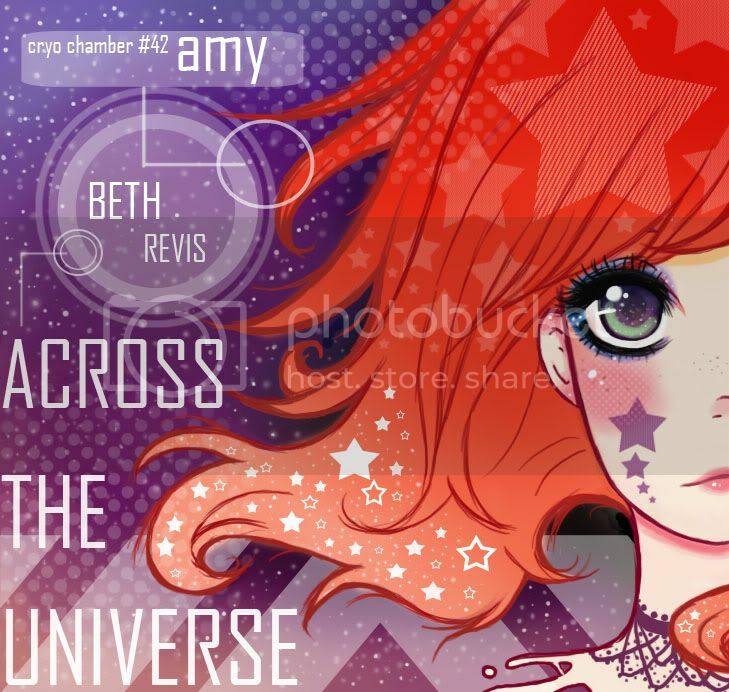 Create something that is creative and linked to ACROSS THE UNIVERSE in some way. And to get a sneak-peek, open for only 24-hours, of what that secret prize will be, then go on the Scavenger Hunt detailed in the post below this one. And if you do that, you'll also get a chance to win a crap-ton of signed books and more prizes!